this new hybrid touchscreen control has set its sights high. coustic Research may not be a brand that you traditionally associate with universal remote controls, but an unexpectedly strong legacy in such products can be found if you take a closer look at some of their related companies. Audiovox, the parent company that currently owns the Acoustic Research name, also owns Jensen and Recoton, both major players in universal remotes in the 1990s, along with RCA Accessories which is a current mass marketer of lower-end remotes. Even Audiovox’s historic Terk brand has been known to release the occasional clicker. More recently, Audiovox has reserved the Acoustic Research name for their higher end control products that are usually designed in partnership with an outside firm. 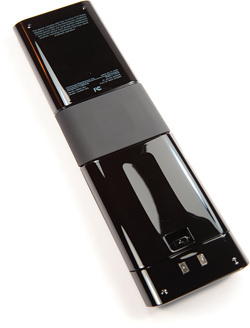 Such was the case with the “WiQ”, a WiFi-enabled and internet-connected remote originally designed and serviced by tvCompass, which has unfortunately since ceased operations. Once bitten twice shy, when Acoustic Research went looking for a new high-end remote they wisely sought out a partner with a stronger track record. 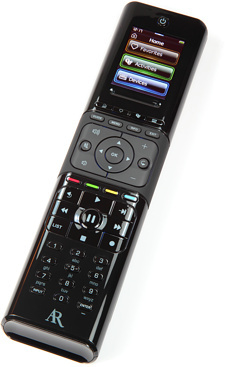 Enter Universal Electronics Inc. (UEI), one of the world’s largest manufacturers of universal remote controls and makers of the ubiquitous One For All series of remotes. While One For All is almost certainly a brand you’re familiar with, the line’s popularity and product offerings in North America have waned of late, with the last major launch probably being the innovative Kameleon series (read our review). Still, One For All remains hugely popular in Europe with a vast array of product offerings. When the intriguing new One For All Xsight series was first announced by the European division, many North Americans were wondering how, when, or even if it would become available in the region. A new name for a familiar product. As the new exclusive North American licensee of One For All products and UEI technology, Audiovox was eager to release an advanced remote control that could compete directly in a consumer market all but dominated by Logitech. And, suitably, they secured the rights to the Xsight. The Acoustic Research Xsight series is comprised of three products: the $249 USD MSRP Xsight Touch model ARRX18G, the $149 MSRP Xsight Color model ARRX15G, and the $99 MSRP Xsight RF Extender model ARRE433B. The primary differences between the Xsight Touch and Xsight Color models are that the Touch has a touchscreen, rechargeable battery and RF capabilities, while the Color... doesn’t. For this review we’ll be covering the premium Touch unit, but will point out other differences between the two models as we go along. Acoustic Research certainly doesn’t shy away from hyperbole when describing the Xsight series. “Simply put, they are the world’s easiest, most intuitive universal remotes.” “The easiest, most advanced universal remote on the market. Period.” “The Xsight line of advanced universal remotes will change your home entertainment experience forever.” This ought to be good!